Decorative marble farmhouse sink with a floral leaf carving on the on the front. It is carved from a solid real beige marble. We offer a large range of stones and different colored marbles that all of our products can be carved from. This design can be made without the decorative leaf on the front. It works great as a vanity stone sink. We can make this custom to your size and with your own design. 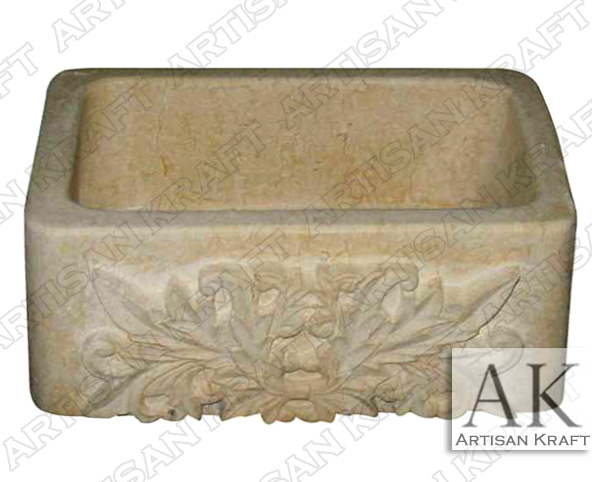 This hand carved marble sink can be carved from a large varieties of marble and other stones. We offer great quality hand carved sinks, fireplaces, range hoods and statues. We deliver marble sinks Globally and have a display in our Chicago Showroom.